There's gold in them thar hills! Well, perhaps not gold, but certainly silver and lead. The "hills" were at the present-day suburb of Indooroopilly, and at the time of discovery the location was known as Finney's Hill. In 1919 two men, G Olson and PJ Madden found what they suspected was precious metal and applied for a mining lease on the area. By November of that year, they were mining the site, initially underground and then later in open cut format as the following images from 1921 show. The mine operated for about ten years, and it's probably fair to say that the returns to the mine's investors were not as great as they had hoped. Mining operations ceased in 1929, and the plant and equipment were sold. The high costs of mining the product and the low prices being received at market made it uneconomical to continue. There are reports that even a diviner was used in an attempt to discover more commercial deposits, but to no avail. But here is a photograph I took the other day. There were people in hard hats, there was equipment in use. What is going on there? 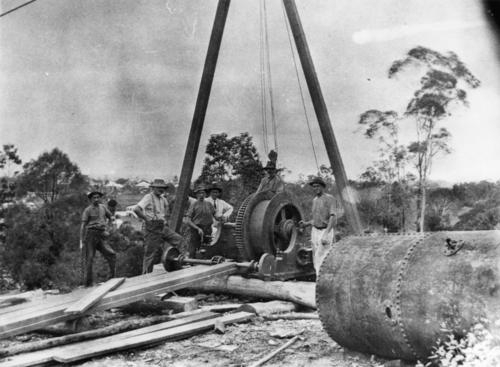 After mining ceased in 1929, the land reverted to the Brisbane City Council and was unused until, in 1951, someone had the idea of using the old mining site to train mining engineering students. The University of Queensland applied for a mining lease, and the site was given over to the students, who had to rehabilitate the old mines. Many of the shafts and tunnels were in disrepair after so many years of neglect, and the first process was to re-establish a safe working environment. These days the site is a registered mine once again, and is of enormous practical use to engineering students in the surveying, ventilation and safety aspects of mining. The University of Queensland was such a picturesque campus in St Lucia, with elegant buildings surrounded by spacious lawns and well designed plantings. 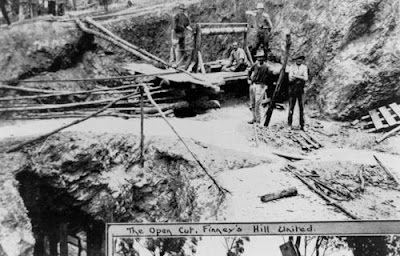 Yet the Indooroopilly mining site looked filthy, rough, dangerous. Was the mining site well separated from the main uni campus? In which place did the engineering students do their lectures? You are correct Hels - the UQ campus is beautiful. The mine site is about 4 km away in a different suburb, albeit a well-to-do one. The site is well camouflaged by trees and set back from the road, so not too obtrusive for the locals. As far as I am aware, normal lectures and tutorials take place at the St Lucia campus and the mine is used for practical work. It's good to know that people thought of making the previous mining site as a new site for engineering students to learn and practice their profession. I really admire those people who have the initiative to make this place a precious place not because it contains lead and silver but because it gives future to the students. I agree with you Walter! I was lucky enough to tour the mine during my first year as an undergraduate engineer - quite a while ago now. I thought they were trying to sell off the land in recent years, but I might be mistaken. In recent years the remnant vegetation on the site has been rehabilitated, and the natural areas on the site restored. You can see some of the jaw-dropping results here: https://www.facebook.com/indooroopilly.mine ... so much wildlife!